On the champagne bottle at the beginning, it says 'Fondee en 1745' (Founded in 1745). When Chekov is about to introduce Demora Sulu, Kirk walks past some panels, almost all of which have 47s on them. Kirk descends ladder 47 to reconfigure the Enterprise-B's deflector dish. Scotty managed to transport only 47 people from Soran's transport ship. There were 47 minutes until the energy ribbon would reach the Veridian system. Accepting a communication from an admiral, Picard gives his security code: "Picard four-seven-alpha-tango." The terminal Picard views the communication on has a small label reading "047." When Picard and Lily are about to enter the Holodeck, Picard enters the program into the holodeck terminal. The camera remains on the control as Picard inputs the commands, and seemingly in response to his input, a "047" appears on the bottom left of the screen. Picard uses access code "Picard four-seven-alpha-tango" again while setting the self-destruct mechanism. When the crew is evacuating to their pods, one of the displays on the bridge zooms in on the destination of one of the pods. 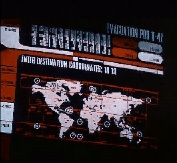 The graphic is labeled "Evacuation Pod T-47." Believe it or not, I found no obvious 47s in neither Insurrection nor Nemesis. When Kirk goes to the shipyard, a sign he is standing near has "Section 47" or "Sector 47" on it. Uhura says she picked up a transmission stating that 47 ships in the Klingon armada were lost in the battle against the Romulan ship. Later, Kirk repeats Uhura's statement that 47 Klingon warbirds were lost in battle.